Today’s buildings should be designed to rely solely on renewable forms of energy. Our site has no access to wind, geothermal or hydropower—and the Dojo is hidden from the sun by the Old Oak. What to do? Meet Taylor, David and Max. These guys are our heroes. Why? Because that’s their roof on Williams St., and the brand new solar panels they’re standing next to are going to generate the Old Oak Dojo’s solar energy. Solar energy was the last piece of the nearly endless Living Building Challenge puzzle. What to do when you want to generate renewable energy, but your property is shaded by 230-year-old oaks? With no real sun exposure at the Dojo, we were stumped as to how to generate our own renewable energy — until we met David Mendelsohn and the persevering team at Sun Bug. 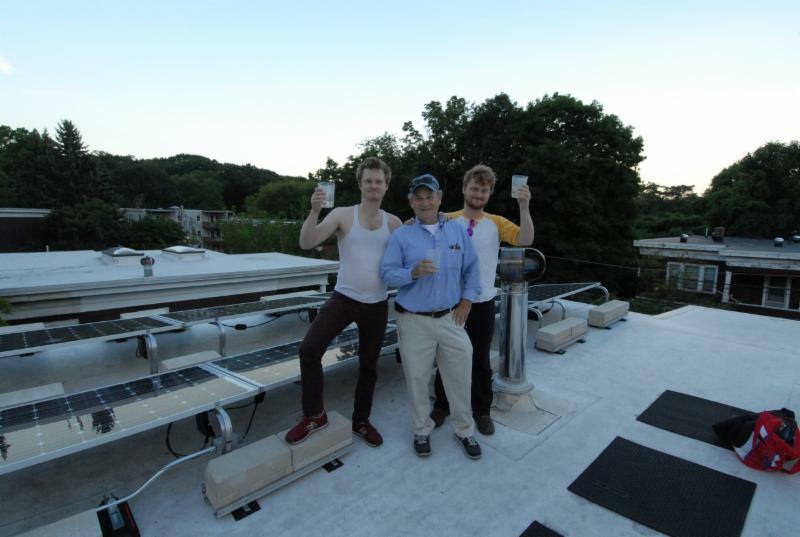 As of September 2014, solar energy (in its net metered form, anyway) is now flowing in our direction. Our approach to accessing solar power is known as “scale jumping.” That means we can partner with another building within our ecodistrict to share green infrastructure such as solar panels.